Dude, where's your Steve Jobs movie? An actor giving a keynote at a tech show is like Slayer playing the county fair. No one knows how they got the gig and it's hard to tell if anyone there wants to hear it. 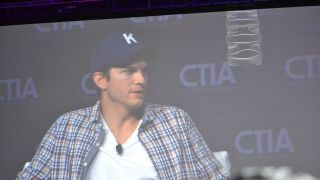 But at CTIA 2013, Ashton Kutcher proved to be an entertaining and thoughtful speaker. While the casually dressed Hollywood star looked out of place speaking to the Oxford and khakis crowd, his fireside chat with CNBC's Julie Boorstin was an injection of life this year's CTIA show sorely needed. Kutcher's talk ranged from mobile app development to his own personal tech investments to the future of digital media. Though Kutcher has been an early investor in a number of startups, including Twitter, Uber and Square, he insisted that he was "just a consumer." The actor was relaxed and affable throughout the chat, which opened the final day of this year's CTIA. Though the "That 70's Show" star did have a few Kelso moments when he waxed philosophical about Facebook as the "new religion," and the problem of users posting pics of their privates on the web. "If you're not mobile you're antiquated," he quipped at one point. Throughout his talk, Kutcher stressed the importance of companies being able to serve customers on the go. He called for restraint in the mobile space, bemoaning sites that meet users at the gate with a pitch to download an app. The star even called out Twitter, a network where he has a massive presence, for being too much of an advertising space. "When Twitter first started it felt like the democratization of media, but now it just feels like the media." He added that making retweeting easier "has hurt Twitter the most. It's a lot of people selling s*** I don't want." Kutcher went on to praise the ad tailoring on Facebook, but said that it has lost its intimacy. He described it as a "weak-tie network," saying that he has too many relative strangers in his feed, which makes him less inclined to share things there. When Boorstin asked Kutcher if Facebook has mastered mobile, he replied that, "no one has mastered mobile." The CNBC correspondent then asked what apps he likes, and the actor whipped out a white iPhone 5 and rattled off a few recommendations from his home screen. Of course, Ashton has an iPhone. Kutcher said that Flipboard was part of his morning routine, and that Spotify was his music service of choice. The actor also mentioned Next Door, a social network that connects people with their neighbors, and Couple, an app designed for intimate communication between two people. The subject of digital distribution of media was enivitable for a Hollywood star at a tech show, especially with Netflix's new season of "Arrested Development" days away. Kutcher said that services like Amazon developing its own content is far from a huge mistake, but investing in them early on could be. When Boorstin asked why Kutcher isn't investing in these platforms, the actor explained that online distributors will only beat out television once they can produce content of the same quality, and to do that, big money needs to be spent. Profit margins will therefore shrink, so he doesn't see them as a sound investment for his portfolio. Kutcher went on to say that peer-to-peer technology interested him as an investment. When asked to name specific startups, Kutcher smirked slyly and said he'd, "rather not say." This sort of succinct talk characterized Boorstin's chat with Kutcher, but things did get a bit strange when the actor/investor compared Facebook to religion. He said that when society moved from tribal life to metropolitan cities, people judged neighbors by their choice of religion. He arrived at the not unreasonable point that people now use social networks to vet each other. He said that, "technology removes time, space and motion," and that with Facebook, "strangers become friends of friends." We understand what Kutcher was getting at, but his explanation was obtuse. It felt like the kind of hazy logic that takes place in the circle on "That 70s Show." Odd digressions aside, Kutcher carried himself like a knowledgeable everyman. Anyone can appreciate his closing dig at expensive cell phone service, saying that, "If Apple wanted to turn on a unified hot spot, I don't think I would need a carrier." One of the biggest tech and gaming shows of the year is coming up. Check out what we expect to see at E3 2013.